English Muffin Pizzas are super simple to make and make the perfect snack or lunch! Tips for how to get a perfect “crust” and how to freeze these English Muffin Pizzas for meal-prep! If you want to see kids smile, make them English Muffin Pizzas. In fact, I still remember the smiles these mini pizzas brought to my face when I was a child–as my mom made them often for my siblings and I. Now I make them for my own kids and whether for lunch, an after-school snack OR just a quick, lazy dinner, these English Muffins always bring a smile to their faces as well. This “recipe” is almost too easy to share. BUT I am always asked for easy, kid-friendly recipes and these English Muffin pizzas, always hit a home run. 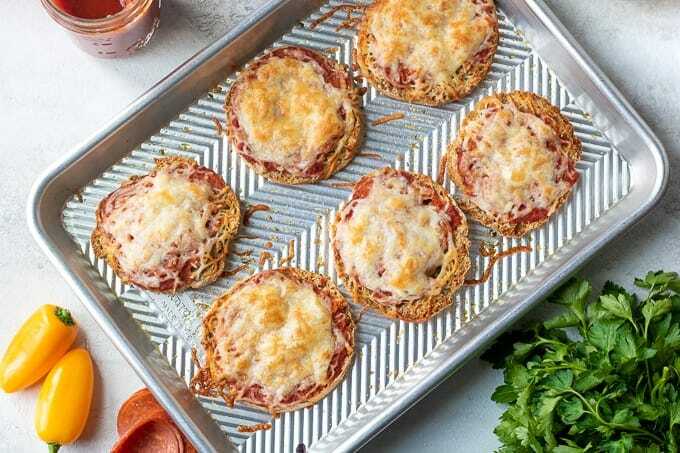 Plus, while these mini pizzas are EXTREMELY easy to make, there are a few tricks to creating the BEST English Muffin Pizza. 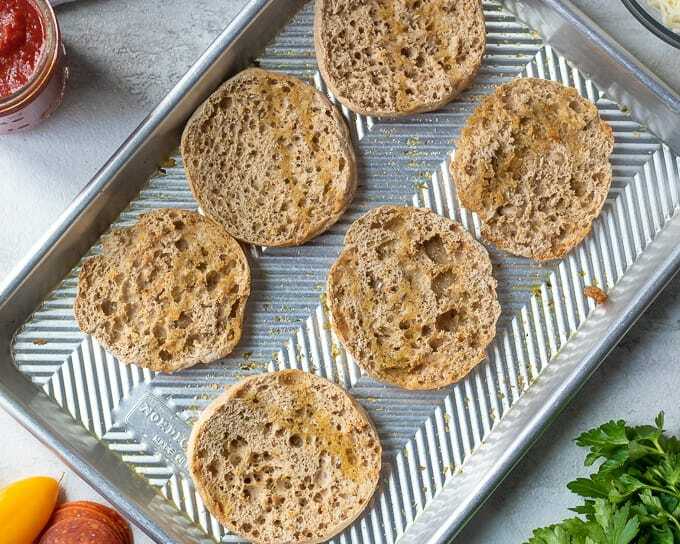 Separate the English Muffins into halves and place onto a baking sheet, nook and cranie side up. Sprinkle with garlic powder and dried oregano. This extra step really gives these English Muffins great flavor. 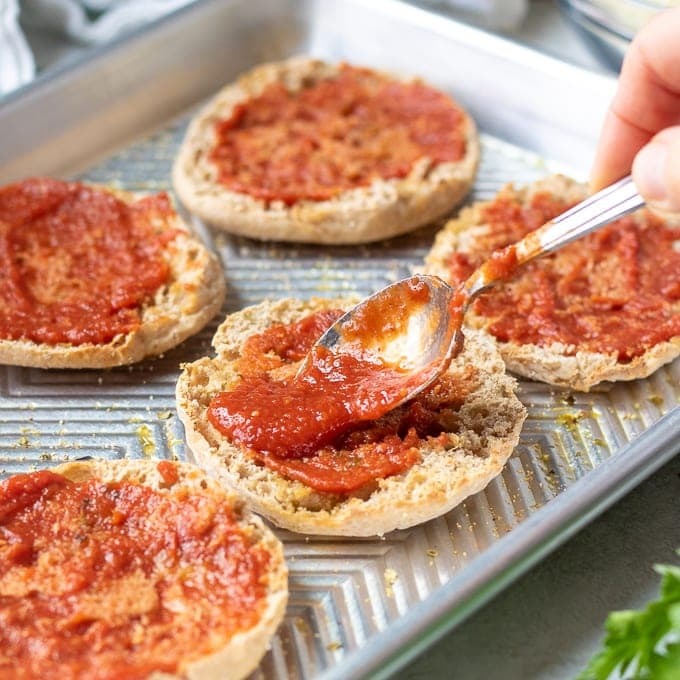 The extra step of toasting the English muffin before topping with your sauce and cheese, will really keep these English Muffin pizzas from getting soggy. Toast the English Muffin until the tops are JUST browned. for about 3-4 minutes at 425 degrees. Spread 1 tablespoon pizza or tomato sauce on each English muffin half. Top generously with shredded mozzarella cheese. Top with any additional pizza toppings such as, pepperoni, olive, peppers, sausage, etc. Return to oven for 5 minutes, or until cheese is melted and browned slightly. Serve or allow to cool to freeze for meal prep. I prefer the taste and texture of these pizzas when prepared in the oven. However in a bind you can use a toaster and microwave, or just microwave to prepare these mini pizzas. If you desire a crisp crust, toast each English Muffin Half. Top with pizza sauce and cheese. Microwave for 45 seconds to 1 minute, or until cheese is melted. 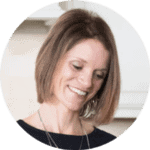 I love to make a large batch of these pizzas and then freeze to pull out for after-school snacks or for school lunches. Allow pizzas to cool on baking sheet. Place cooled baking sheet, with the pizzas, into the freezer for 20-30 minutes, or until frozen solid. Remove pizzas from baking sheet and place in freezer safe container or freezer bag. Place in a 425 degree oven for 10 minutes or until warmed through. I often will put frozen mini pizzas right into my kids’ lunches as well. I pack the lunches the night before and store in the fridge. 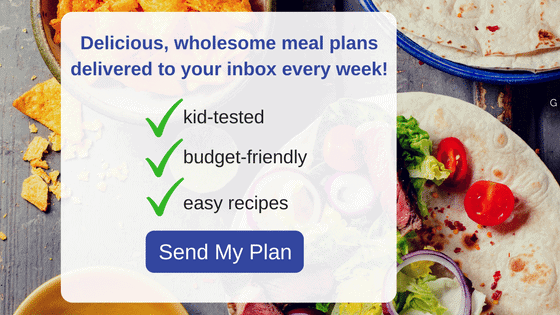 In the morning, I place the lunches, along with an ice pack, in my kids’ lunch boxes and by lunchtime, they enjoy a defrosted pizza muffin. Albeit cold, but they still LOVE them! 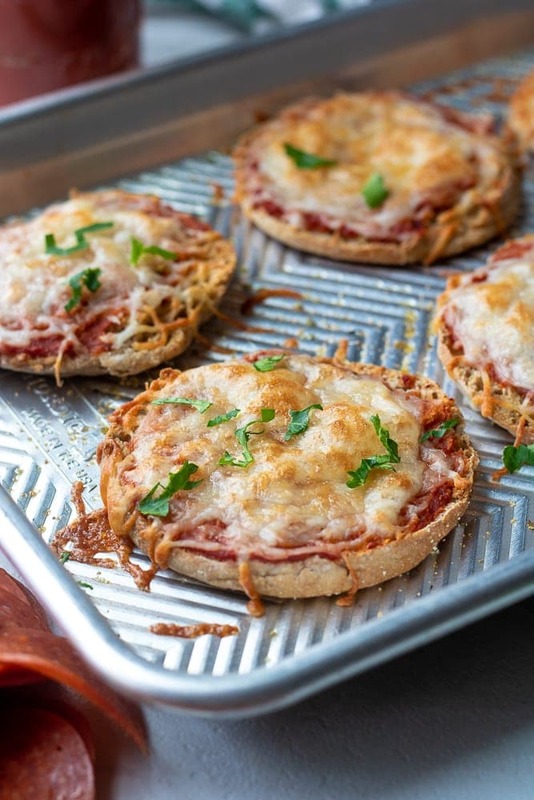 English Muffin Pizzas are super simple to make and make the perfect snack or lunch! Tips for how to get a perfect "crust" and how to freeze these English Muffin Pizzas for meal-prep! Mix together olive oil with garlic powder and oregano. Brush on each English Muffin half. Alternatively, just drizzle with olive oil and sprinkle with seasonings. Toast in oven for 5 minutes, or until just browned. 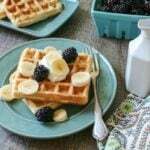 Remove toasted English Muffins from oven. Top each half with 1/2-1 tablespoon tomato sauce and cover with cheese. Return to oven and bake until cheese is melted and bubbly, about 5 minutes. Feel free to add any toppings to these mini pizzas as desired. Instead of baking, you can broil or microwave these mini pizzas. If using a broiler, just be careful not to burn.